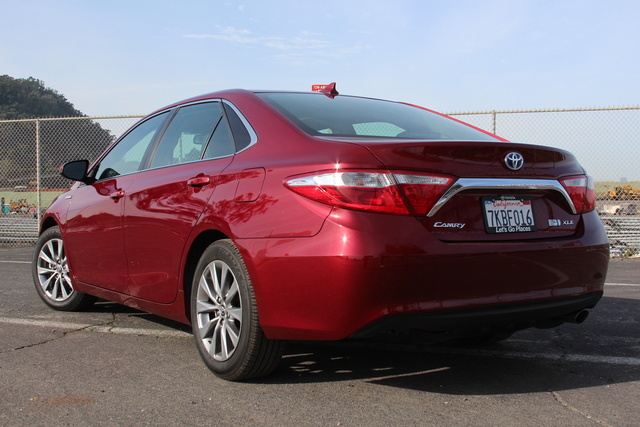 CarGurus has 74,828 nationwide Camry listings starting at $1,100. The Camry faces stiff competition among the new class of hybrids, despite its impressive space, features, and safety record. While Toyota is still the industry leader in hybrid offerings, competitors have had plenty of time to refine their offerings. The Camry provides a hybrid experience that’s competent in all categories, but buyers are now faced with options that can boast a better ride as well as more economy or more luxury, depending on their preference. And while the Camry got an update just last year, the midsize sedan class is competitive enough that this barely keeps the Camry up to date. Toyota’s been at the hybrid game for a while now, so it’s no surprise that the Camry Hybrid provides a nearly seamless experience. The powertrain is smooth and responsive, the ride is composed, and the infotainment system is intuitive. Not only that, but space in the backseat and trunk alike is nearly class-leading. Toss in a Top Safety Pick rating from the Insurance Institute for Highway Safety, and it would take a very competitive class to keep the Camry from a top spot. Unfortunately for Toyota, that’s exactly where the Camry lives. 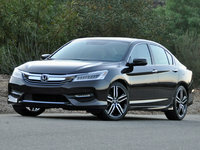 The hybrid offerings from Ford, Volkswagen, and Honda will all outperform the Camry when it comes to fuel economy, and most offer a more engaging ride as well. Still, the Camry is a solid choice regardless of the category - a monument to competency, if you will. For my week with the Camry Hybrid, Toyota sent me an XLE sedan outfitted with options like a year’s subscription to Toyota’s Safety Connect service ($515), a blind-spot monitor with cross-traffic alert ($500), and the Convenience Package ($345) to add features like an auto-dimming rear-view mirror and keyless entry & ignition. This example was also fitted with the Premium Entune system with JBL audio ($1,330) and the Advanced Technology Package ($750), which adds the Pre-Collision System, Lane Departure Alert, Dynamic Radar Cruise Control, and automatic high beams. With a $395 charge for the Ruby Flame Pearl color, the $915 moonroof and the optional Qi wireless charging ($75), the $835 delivery fee brought the MSRP to $35,800. 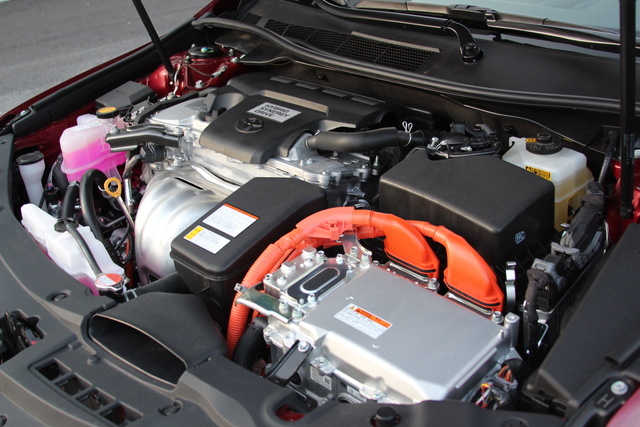 The Camry is powered by the same 2.5-liter inline 4-cylinder/electric motor combination used in the Avalon and the Lexus ES 300h, combined with a 244.8-volt nickel-metal hydride (Ni-MH) battery pack. With 156 hp provided by the gasoline engine at 5,700 rpm and 156 lb-ft of torque at 4,500 rpm, it’s the electric motor’s 199 lb-ft of torque from 0 rpm that provides all the stop-and-go oomph. Combined with the 141 equivalent horsepower that the electric motor later puts out, the Camry Hybrid is rated at 200 hp overall, a confusing rating given the numbers involved. What it really adds up to is a 7.7-second 0-60 time and an EPA estimated 40 mpg city/38 mpg highway rating. Personally, I wasn’t able to replicate the 40-mpg-combined rating. In fact, I didn’t even come close. That said, I was certainly being a bit more aggressive with the accelerator than most, although my total time included more than 2 hours of highway cruising and more than half of my driving time in Eco mode. The Camry Hybrid is also advertised as being able to operate under electric-only power for over a mile at speeds up to 25 mph, but this was another claim I was unable to verify. Even over flat surfaces, the gasoline engine would kick in after just a couple tenths of a mile, despite avoiding any assertive acceleration and staying below 20 mph. Drive up any hills, and electric-only operation will end even more quickly. The Camry might not be the most up-to-date option in the class, but there are also no surprises here. Everything works well, and without complication. The Entune Premium system even received an upgrade this year, adding cell-phone integration and real-time traffic and weather. Rear-seat room is ample, and at 13.1 cubic feet, the Hybrid gives up only 2.3 cubes of trunk space to the gasoline version. With the XLE trim, you’ll even get to enjoy dual-zone automatic climate controls, 17-inch alloys, LEDs, an auto-dimming rear-view, and heated power front seats. The optional 10-speaker JBL sound system provides great sound, and the Technology and Safety Connect packages mean nearly every safety feature on the market is included. Of special note is the optional Qi wireless charging, not only for its innovation, but for the fact that most of the phones that utilize said charging ability are too big to fit in the charging cradle, rendering them unable to charge. Leather covers the seats and steering wheel alike, accented by contrast stitching. There’s enough comfort and support for all-day driving, whether cruising on the highway and backroads or sitting in traffic, and soft-touch materials and unique trim provide some visual interest as well. 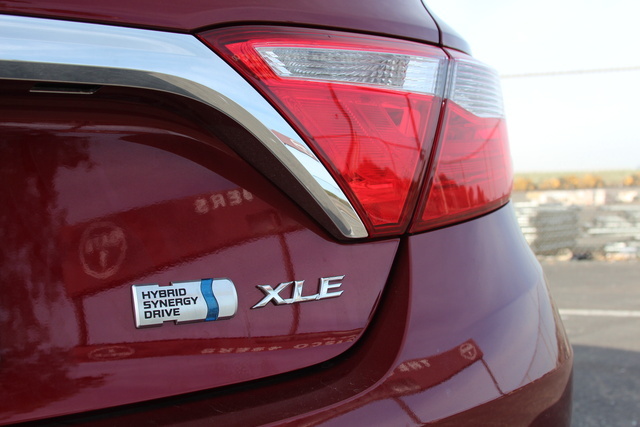 There’s no lack of tech here, as the Camry Hybrid comes well-equipped at the base level, let alone in XLE trim. The Entune Premium system, controlled through the 7-inch touchscreen, has always been a strong point for Toyota, and the upgrade this year only highlights that fact. 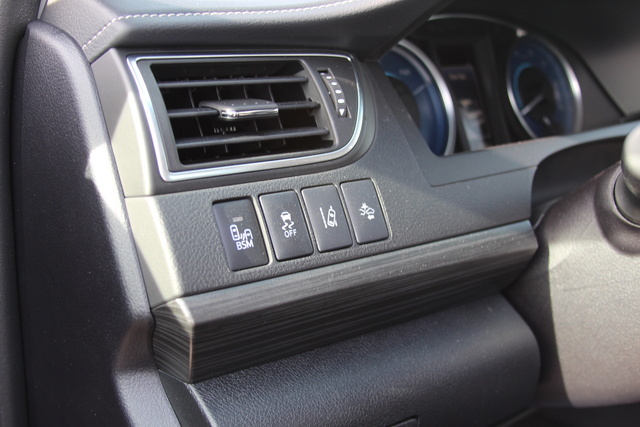 The backup camera is nearly unnecessary as the Camry boasts great visibility all around, but it’s a nice touch nonetheless, and the dual 12-volt power outlets coupled with the USB and Aux inputs mean the cabin has a lot of connection points. Options here round out the package with features like Dynamic Radar Cruise Control, which will vary your speed depending on who’s occupying the lane, lane-departure and blind-spot systems with cross-traffic alert, and a pre-collision system. The Qi wireless charging deserves another mention as it’s such a fun feature, but the lack of planning that led to so many models of phone not fitting in the station is a real tragedy, especially when the models that use it tend to run on the large side. The Camry Hybrid is a Top Safety Pick for the Insurance Institute for Highway Safety and enjoys a 5-star overall rating from the National Highway Traffic Safety Administration, with 5 stars in side impacts and 4 stars for frontal. It comes with 10 airbags, including full curtain and dual side-knee, 4-wheel disc brakes with ABS, and traction and stability control. 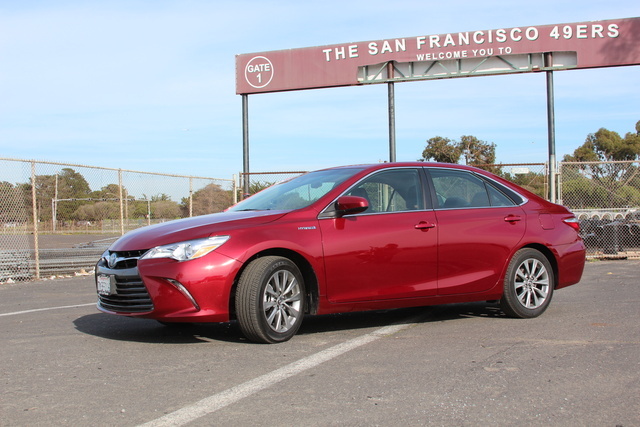 Stopping distance from 60 mph is around 125 feet, which is average for the midsize hybrid segment, but given the Camry Hybrid's low-rolling resistance tires, that number could be a lot lower. In fact, despite the traction and stability-control systems, I found the Camry Hybrid’s tires to be severely lacking in traction, especially in the wet. Even mild acceleration in the corners would break loose the tires, and spirited cornering could induce sliding. Not good. Much like the Tundra, the Camry Hybrid is not a bad vehicle — it’s safe, it’s quick, it’s simple, and everything works quite well. It’s just that competitors are beating it in the categories that matter: fuel economy and ride quality. With the Ford Fusion Hybrid putting up numbers like 40 mpg city/44 highway, the Jetta 42/48, and the Honda Accord 50/45, the Camry’s 40/38 just can’t compete. 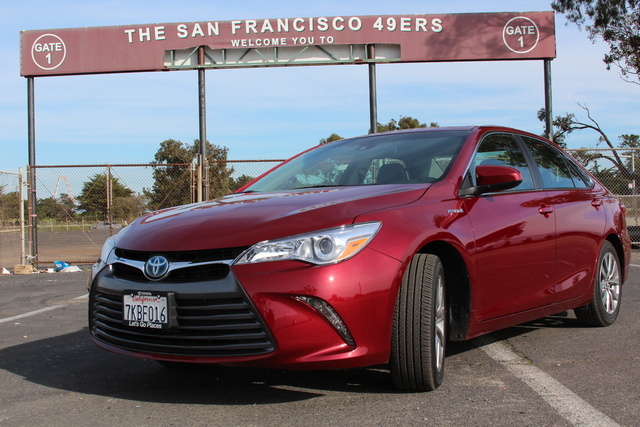 The fact that all three offer a more engaging, enjoyable ride than the Camry only seals the deal. But the Camry is better in this category than it’s ever been, even if it’s still not the best. And it’s hard to argue with Toyota’s experience with hybrid technology. There’s a reason the Camry is the best-selling car in America, and its reputation for reliability is definitely part of that success. Add in Kelley Blue Book’s projected resale value here, and the Camry almost makes up for its shortcomings against rivals. 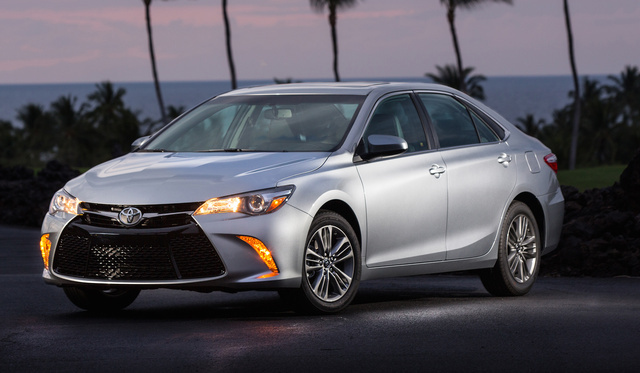 What's your take on the 2016 Toyota Camry? Darell we just took delivery of a 2016 Camry le. 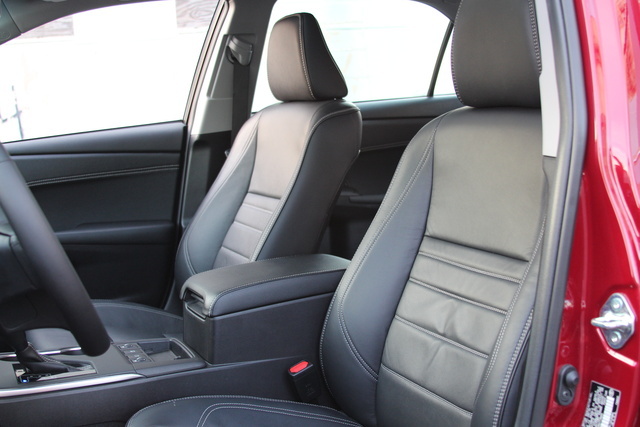 seats are not as comfortable as our 1995 or 2009 hybrid is. Maybe I should've bought the xle. Mark The premium sound system is 4 times worse than a $79 blue tooth speaker by jam heavy metal. 1330 is a rip off. I have the 2016 and my brother's 2012 Toyota Camry premium radio is far superior in sound. I am upset and can not believe you would think it great. It is garbage. Users ranked 2016 Toyota Camry against other cars which they drove/owned. Each ranking was based on 9 categories. Here is the summary of top rankings. Have you driven a 2016 Toyota Camry? Hi I have a Camry hybrid 2016 Is mabanol oil 0w20 perfect for this car?